Sandra J. Chockley, 79, of Rushville, passed away at 7:00 PM, Wednesday, November 21, 2018, at Heritage Manor in Beardstown. She was born on May 6, 1939, in Schuyler County, Illinois, the daughter of Claude Howard “Pug” and Nina Rosalie (Armel) Sipes. She married Richard Chockley on June 29, 1957, in Rushville and he survives. Also surviving are two daughters, Donna Slaton and husband Phillip of Galesburg, and Barb Slaton and husband Douglas of Knoxville, one son, Rod Chockley (Debbie Lindsey) of Rushville, eight grandchildren, Lorah Lackland and husband Kurt, David Slaton, Laith Slaton, John Slaton and wife Lauren, Rae Slaton, Courtney Gray(Adam Newton), Kelsey Chockley and Takoda Crenshaw, 2 great grandchildren, Bentley and Lola Bigham and one on the way in Decemeber, one sister, Gwendolyn Root and husband George of Gillespie, brother-in-law, Robert Crouse of Rushville, sister-in-law, Linda Tankersley and husband Ken of Goodlettsville, Tennessee and several nieces and nephews. She was preceded in death by her parents, three sisters, Gladys Taber, Portia Brierton, Delores Crouse and two infant sisters. A 1957 graduate of Rushville High School, Sandy worked at the Rushville Dairy Queen for 40 years retiring in January, 2012. 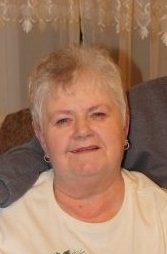 She was a member of the Rushville Assembly of God Church. She served as a Girl Scout leader and volunteered at the HELP Center in Rushville. She enjoyed sewing, crafts, going to various community and music events. She collected Andy Griffith memorabilia. Sandy was well known for her sense of humor. She loved spending time with her grandchildren. They couldn’t wait to open their birthday cards to see how grandma had folded their money. Services will be at 11:00 AM, Wednesday, November 28, 2018, at the Wood Funeral Home in Rushville, with Pastor Terry Lucas officiating. Interment will follow in the Rushville City Cemetery. Visitation will be from 4:00 PM to 7:00 PM, Tuesday, November 27, 2018, at the Wood Funeral Home in Rushville. Memorials are suggested to St. Jude’s Children’s Research Hospital, Culbertson Memorial Hospital in Rushville or Heritage Manor in Beardstown.